For other people named Thomas Austin, see Thomas Austin (disambiguation). 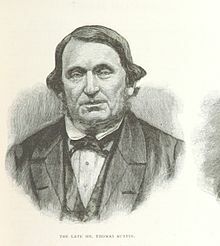 Thomas Austin (1815 – 15 December 1871) was an English settler in Australia who is generally noted for the introduction of rabbits into Australia in 1859. Thomas Austin was born at Baltonsborough, Somerset, England, the youngest son of John Austin and Nancy, née Lucas. In 1831 he arrived with other members of his family in Hobart Town, Van Diemen's Land (now Tasmania). After farming near Ouse, Thomas and his brother James crossed Bass Strait in 1837 and settled as pioneer pastoralists in the Western District of the Port Phillip District (now called Victoria). In 1845 he married Elizabeth Phillips Harding (1821–1910) in Melbourne and they had 11 children. Thomas Austin took up land near Winchelsea starting in 1837, and eventually created a run of 29,000 acres (12,000 ha) known as Barwon Park. The property was used for sheep and for horse training. In 1871 work was completed on the bluestone mansion that Austin had designed and built on his property. This is now owned by the National Trust of Australia and is open to the public. He died six months after the mansion was completed but his widow continued to live there and, as a philanthropist, helped to found the Austin Hospital in Heidelberg and the Austin Homes for Women in Geelong. As a member of the Acclimatisation Society of Victoria, Thomas Austin helped to introduce many species from England. In 1861 he wrote that he had introduced hares, blackbirds and thrushes, and that he was breeding English wild rabbits and partridges. He introduced 24 breeding rabbits (Oryctolagus cuniculus) on his estate in southern Australia, near Melbourne, in October 1859 as game for shooting parties. While his efforts were praised at the time, he has borne the brunt of blame for introducing this pest to Australia. ^ "A GREAT BENEFACTRESS". The Argus. 3 September 1910. ^ "The late Mr Thomas Austin". The Argus. 18 December 1871. p. 6. ^ "THE ACCLIMATISATION SOCIETY". The Argus. 21 April 1864. p. 7. This page was last edited on 18 January 2019, at 12:03 (UTC).